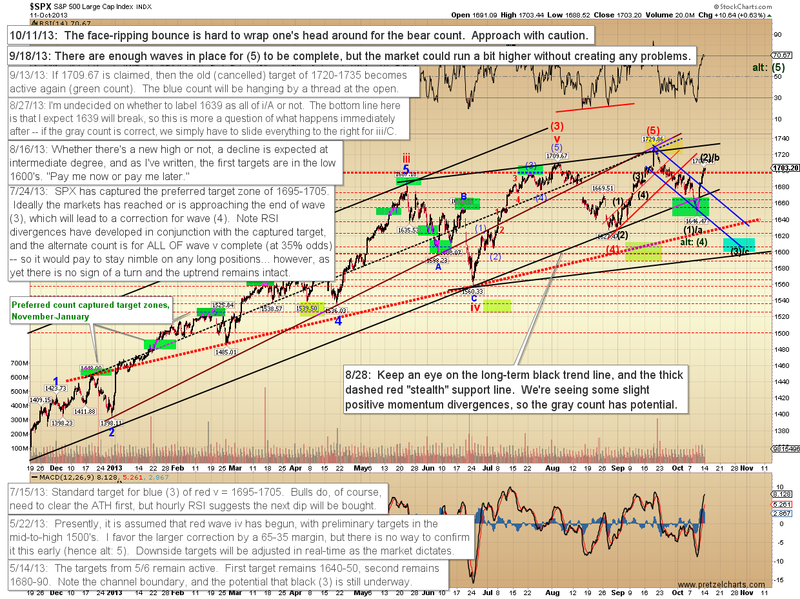 Pretzel Logic's Market Charts and Analysis: Friday's Projection Played Out; What Next? Friday's Projection Played Out; What Next? On Friday, I drew a somewhat unconventional near-term projection, projecting the market would close at 1703 and decline first thing Monday. Shortly after Friday's close, CME announced that it's raising margin requirements -- which is a bit of an unusual move, given the relatively low volatility we've had this year. If we assume traders are net long after that rally, the newly-increased margin should impact bulls more than bears. Then over the weekend, Congress and the White House indicated that the only point on which they both agree is that they still hate each other. In the spirit of true bipartisanship, the President stated that he wouldn't be willing to work with Congress "even if it was the last Congress on earth," while Speaker Boehner was quoted as saying he'd be willing to negotiate "only if President Obama stops making fun of my tan." This rhetoric was markedly less virulent than last week's, so pundits are arguing that these statements mean we're extremely close to an agreement. All that to say: the news over the weekend wasn't terribly good, and futures are suggesting a decent-sized gap down for Monday's open. This means I hit the short-term projections exceptionally well -- but I would caution that my short-term work is based on (oddly enough) the short-term; so neither the close at 1703 nor the ensuing gap down will guarantee that the intermediate wave counts are also correct. This is a truly difficult position for intermediate prognostication, because the market has been essentially range-bound for the past several months, and very little information is conveyed within a range-bound market. To make matters even more challenging, markets often move quickly through thinly-traded ranges, which can give the appearance of greater strength (or weakness) than is actually present, causing indicators to give false readings. These are some of the reasons this is boiling down to an instinct call for me: there simply isn't much in the charts to argue definitively for one outcome over the other. I still feel it's more likely that the decline isn't done at intermediate degree, and that a stronger sell-off is pending. And I think it's safe to say I'm probably bucking majority sentiment with this view: from what I've been able to gather, most everyone is expecting that Washington will get its act together reasonably soon. I think everyone expects a nail-biter which then gets resolved in the eleventh hour -- and maybe that will happen, who knows. If Washington announces a satisfactory resolution, bears will almost certainly cover in droves and send the market straight up in a vicious short-covering rally. For that reason, this is not a position where I would continue to hold my shorts in the face of a solid market reaction to good news. I'm hoping my short entry north of 1700 guarantees me some profit no matter what happens heading forward -- and hopefully Friday's update afforded readers that same opportunity. Let's start off with the S&P 500 (SPX). 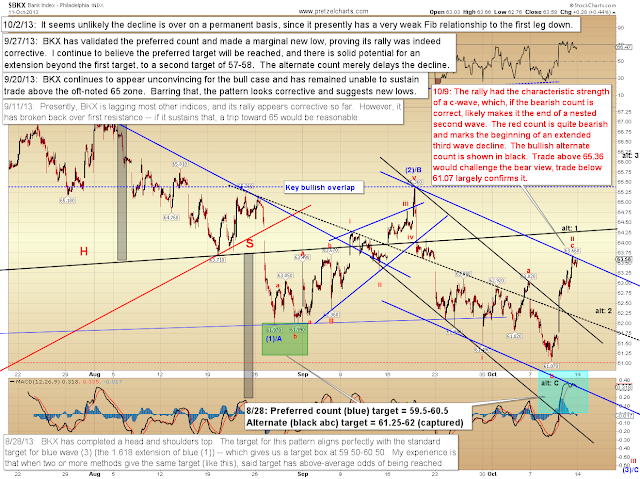 This chart shows the trading range quite clearly. The market really hasn't made much upwards progress since May; so while bears seem to be feeling more beat-up, the bulls really haven't had too much to cheer about lately either. Range bound markets don't favor bulls or bears: they favor short-term traders. Next is the SPX 10-minute chart; the preferred red count is unchanged from Friday's update, but I needed to adjust the green alternate count slightly. 1. The Fibonacci relationship between waves A and C is still a bit weak. 2. The last decline didn't act like a c-wave. C-waves are third waves, and they are usually strong and scary. One of the "jobs" of a c-wave is to convince traders the trend has changed. While the last leg of the decline in SPX was strong, BKX merely lollygagged around support and probably wouldn't have frightened even the most faint-hearted bull. In conclusion, there genuinely isn't too much to add down here. 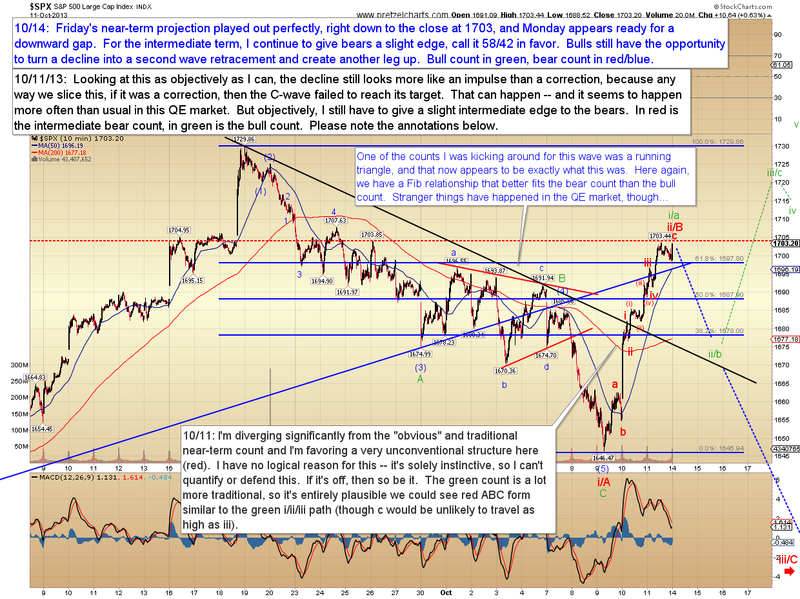 Bears should stay alert to a three-wave decline as warning of the alternate count. Hopefully Friday's entry was solid enough that even in the event of the bullish count, we'll be alerted to bullish developments in real-time and be able to lock-in profits. Trade safe. It will be interesting to see how the market plays out. Still thinking that an 11th hour deal will be worked out by congress. 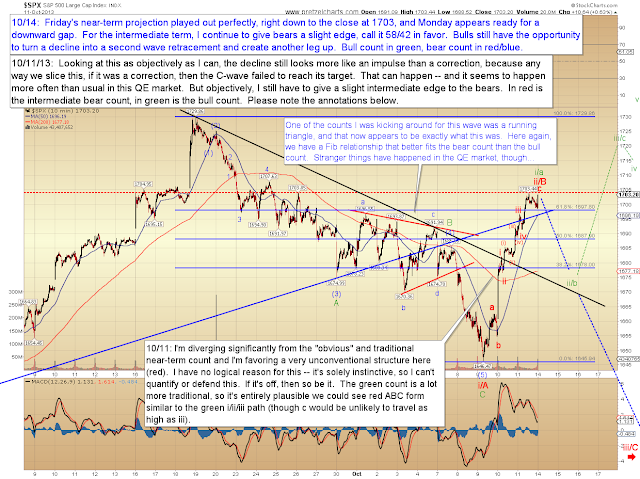 Then a rally to the 1750 region of the SPX ??? Great call on Friday Pretzel. You actually identified that 1697-1709 zone (with 1705 as 'ideal') some days ago as an alternate count. Very nicely done sir. This market is throwing most traders like a rodeo bull on meth.